​On a map, Chile looks like a long ribbon reaching from the middle of South America's west coast (18°S) straight down to the southern tip of the continent (56°S). Chile's neighbors are Peru and Bolivia to the north and Argentina to the east. To the west, Chile is bounded by the Pacific Ocean. Chile, from its north end to the city of Puerto Montt consists of three distinct longitudinal structural regions - the Andes, the central Valley and the coastal range. South of Puerto Montt, begins Patagonia and although these structures remain, there are some major changes. The coastal range peaks turn into a chain of around 3,000 hilly islands; the central valley (now under the sea) is the Canal Moraleda, and the Andes highest peaks are on the coastline. Patagonia ends at the famous Strait of Magellan. Across the strait we find Tierra del Fuego, and then the southern extreme of America, the mythical Cape Horn. 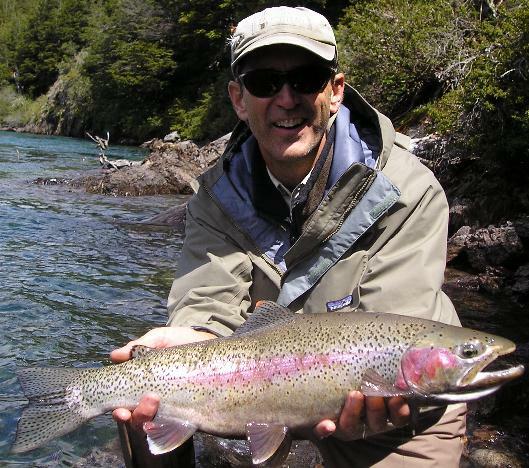 ​Coihaique, the heart of Chilean Patagonia fly fishing, is a three hour flight from Santiago. Isolated from the capital and main population centers of Chile, Coyhaique boasts all the comforts of a fair sized town. There are excellent places to stay, restaurants, grocery stores, and excellent medical facilities.The scenery is splendid. Coyhaique is surrounded by the Southern Andes, and the untainted rivers and lakes that nourish this vast wilderness. "Alex, I really enjoyed my days fishing with you and of course, apart from what I learned about fishing, the experiences of being in Chile were something that I shall remember for a long time. Hopefully I will be able to come back sometime either with my wife or a group of fishing mates. Thanks again and it was a pleasure also to meet your lovely family." Chile’s growing economy is a model for other countries around the globe. The people are friendly and always willing to help travelers. It’s very safe and there is no terrorism of any kind. There are no tropical diseases. There are neither poisonous animals nor plants. Come and enjoy the high quality fly fishing that Coyhaique has to offer. Chile is the country to visit, Patagonia is the place to fish and Southern Exposure is your outfitter ! Waiter, waiter, what’s wrong with this fish? Long time no sea, sir.